simple FICS client (see details at Connecting Chess for Android with FICS)improved electronic chessboard support (DGT/Certabo/Millennium)rudimentary DGT chess clock support (shows moves) The FICS interface is simple, in line with the design philosophy I have always followed so far. Despite the simplicity, the client is fully functional, and I have started to enjoy playing online over an actual chessboard myself. Hopefully others will find the combination of an electronic chessboard and online play just as enjoyable! A big thank you to my testers! Writing a client from scratch was a non-trivial task, and took a long time. Having awesome testers was extremely helpful during the initial development. Any remaining bugs are mine, of course. Please send me the details if you find one. 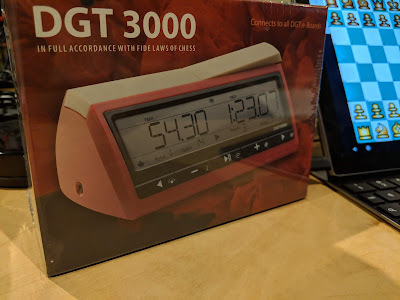 This beautiful DGT 3000 chess clock just arrived! 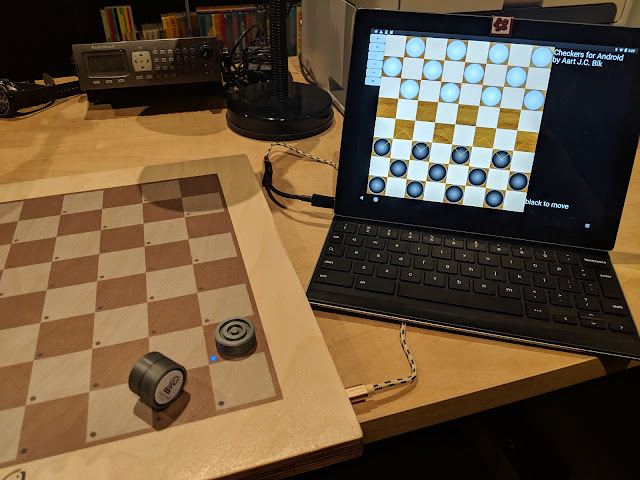 I can't wait to start hacking and find out what features I can implement for Chess for Android connected to a DGT chess board and this clock. In particular, am hopeful that the combination of online chess on FICS with an electronic chess board and clock will provide a very pleasant chess playing experience! 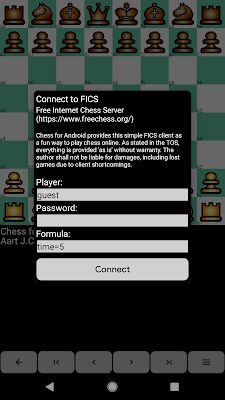 It took me a bit longer than planned, but I finally finished the alpha version of a FICS (Free Internet Chess Server) interface in Chess for Android. 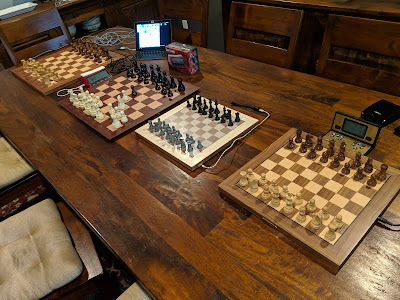 Either play directly on a phone or table, or first connect to an electronic chessboard (DGT, Certabo, and Millennium) to play over an actual chess board with people online. To connect to FICS, long press the notation window in Chess for Android to open the extended menu. Then select "Connect to FICS" and login as a guest or using your register username and password. The formula string can be used to filter out match requests. For example time >= 5 & inc = 1 only accepts games with at least five minutes start time per player and exactly one second increment per move. The formula syntax is explained in more detail on the FICS help page. 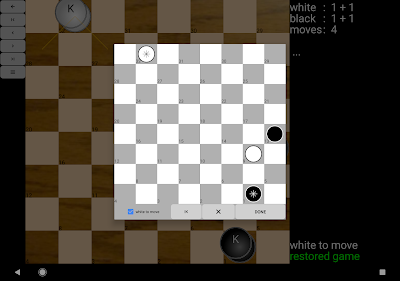 I can't believe it, but Chess for Android just passed its ten year anniversary! In November 2008, it appears for the first time on the -then-called- Android Market, together with Reversi for Android. Checkers for Android was soon to follow. The Android Market was later renamed Google Play. 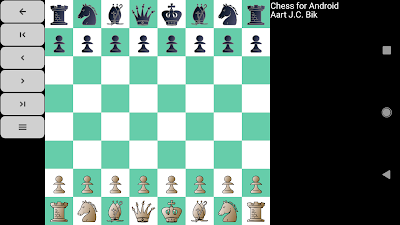 Configurable tags for PGN export (player, ELO, event)Ability to offer draw or resign (click king twice to enter menu)Support for Certabo electronic chessboards The application now supports connecting to any of the DGT, Millennium, and Certabo chessboards (let me know if there are others). I have a second instructional video on this topic on YouTube. As usual, looking forward to your constructive feedback!